Marvelous Catholic Jerusalem St.Benedict Rosary , Beautiful Pink Crystal Beads With Gold Plated Separating St. Benedict Beads That Lead to Miraculous Medallion And To Enamel Gold Plated Crucifix that hangs from a single row of beads,Handmade From Holy Land. Our staff selects rosaries based on several strict criteria including durability, quality of materials, and beauty. 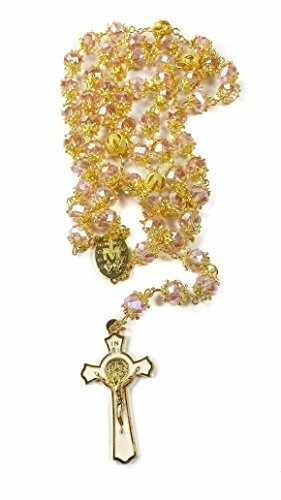 Highest Quality Rosary Catholic Beautiful Light Pink Crystals Beads With Gold Plated Beads Rosary and Enamel - Metal Saint Benedict Crucifix Long Beaded Necklace With Miraculous Medal . The beads lead to the Medal And To Benedict Crucifix that Hangs from a single row of beads, Comes In a Jerusalem Souvenir Plastic Box. Item From Jerusalem Holy Land. (H X W) : 5 cm x 2.8 cm / 2" x 1.1"
DON'T MISS YOUR CHANCE TO HAVE A SMALL PART OF HOLY LAND IN YOUR HOME! If you have any questions about this product by Nazareth Market Store, contact us by completing and submitting the form below. If you are looking for a specif part number, please include it with your message.